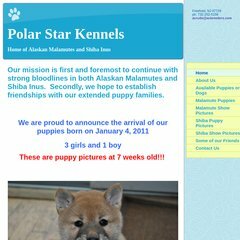 Topics: Available Puppies Or Dogs, Malamute Puppies, Malamute Show Pictures, Shiba Puppy Pictures, and Shiba Show Pictures. Its local IP address is 98.139.134.174. Yahoo Inc (California, Sunnyvale) is the location of the YTS/1 server. Its 4 DNS Records include, yns1.yahoo.com, yns2.yahoo.com, and ns8.san.yahoo.com.